I love writer's workshop! I've had the chance to go to Columbia University Teacher's College in NYC for the Reading & Writing Project run by Lucy Calkins twice for writing! Writing has gone from my least favorite to one of my most favorite subjects to teach. 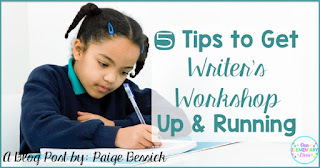 I want to give you 5 tips more tips to get writer's workshop up and running. Want to see the first 5 tips? Check out >>THIS<< blog post. 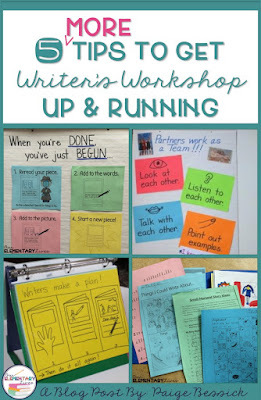 Like I said earlier, this is post #2 with tips to get Writer's Workshop up and running. Click the image below to see the first post. 1. There is No Such Thing as "Done"
We've all heard it, a writer finishes a story on day 1 of writer's workshop, "I'm doooone" they say. You want to make it really clear what to do when they think they are done with a piece of writing. And you'll probably want to do this mini-lesson in the first week of writer's workshop, maybe even the second day. That's it, they choose one of those and that should keep them busy until they think they're "done" again (in like 2 minutes 😂). They will probably come to you at least 7 times each day, telling you they're done unless you teach them what to do when they are done. 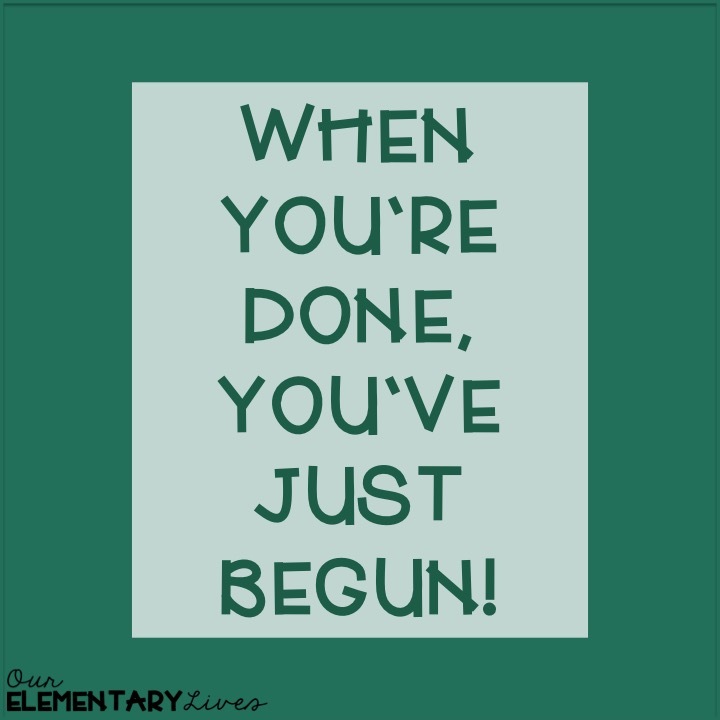 My students learn really fast, that if they come to me and say "I'm done" I always say, "you've just begun!" If you use Lucy Calkin's Units of Study, I believe this is in one of the first lessons. Teach it then and make sure you come back to it often until your students get it. This one is so important at any grade, but can often be difficult in the early grades. The idea of goal setting is something we talk about often, but it can take students a little while to truly understand what it means. 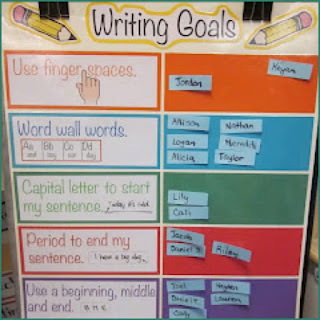 At the beginning of the year in first grade, we do a lot of class goals (write for 5 minutes, write for 10 minutes, everyone finish 2 pages of writing, etc.) As they begin to understand goal setting, we move towards independent goals starting by setting one goal at a time. Then as they get stronger at that, we talk about working towards 2-3 goals. That's more towards the end of the year in first grade. Some simple goals you can start with are: adding spaces, write for 10 minutes, use your word wall, finish a piece each day. Some more difficult goals you can work towards are: add thinking or dialogue to your writing, find 3 places to revise and add words to your piece, add more details to your pictures. Zeek's Zoo has a great visual you can use for having students set their goals. This example would be a great one for the beginning of the year. You could change out the goals on the left as your students become stronger writers. She even has a FREE printable for you. Check out her post by clicking >>HERE<< or on the image below. 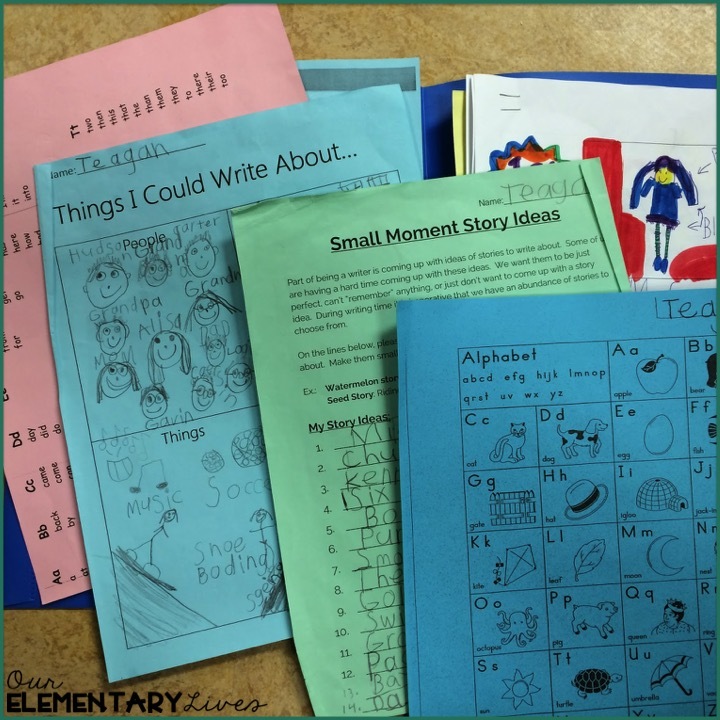 Deedee Wills, from Mrs. Wills' Kindergarten, also has a great blog post about writing goals. You can check that out >>HERE<<! You want to make sure you're providing students with what they need to succeed. We want to make sure they have access to tools that will support them during their writing time, otherwise, they will come to ask asking-how do you spell? I always make sure they have access to word walls, anchor charts, check lists, etc. This is a sample of what might be in my student's folder at any given time. The first blog post had a tip of having writing folders that support. You could make these accessible around the room too. Each student has a word wall in their writing folder that has our first grade sight words. We also add other important words throughout the year. I typically give them one with only 50 words on it to start the year, then about half way through, they get the full word wall with 100 words. The larger list can be a little daunting for the little firsties at the beginning of the year. Another way to make tools accessible is with table charts. 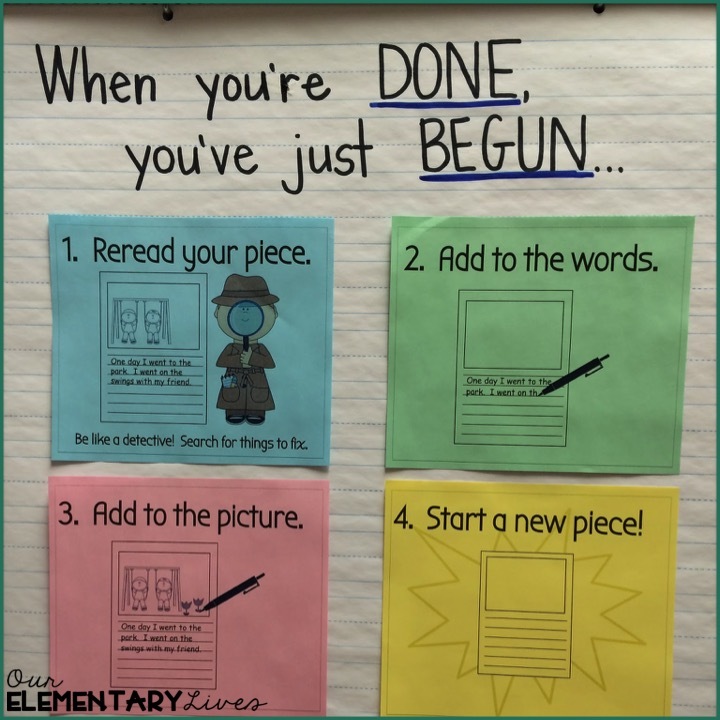 When you make an anchor chart, take a picture and shrink it down then put them in binders at each table or work space. Ahhh….partners. I could do a whole blog post on writing partners. I’m just going to just touch the surface here. We use our partners every day. They are the same as their reading partner. We use them to help us plan, practice, fix up, we use them ALL THE TIME! Teach the students to use their partner for things they can do independently together. Rather than having kids come up to you for something, suggest they use their partner to help. 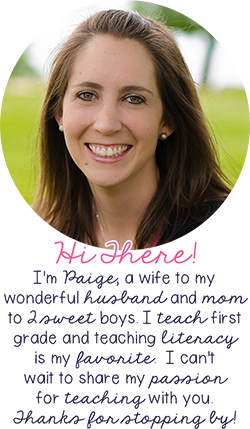 My conferring time is sacred and I don’t want kids coming up to me for questions their partner can answer. It is so important though to teach how to use their partners. 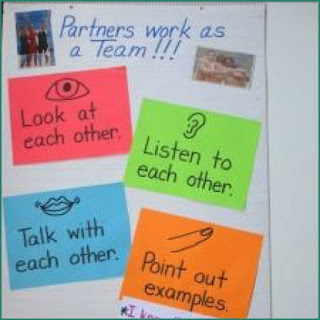 Set up anchor charts, have demonstrations with parents who work well together and come back to the expectations often. When you pick partners, I would suggest pairing them by ability levels. You want them to be able to help each other. If you pair high and low students, the higher student will most likely do all the work. I typically keep partners the same for awhile if they are working well together. 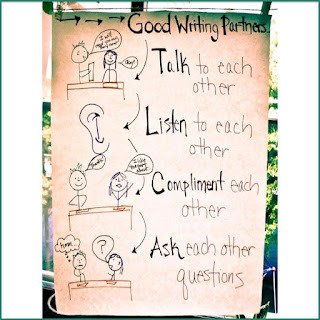 By allowing our students to work with their partners, we are creating a community of writers and it builds accountability. We share with our partner every day at the end of writer's workshop. When a student has nothing to share because they didn't write anything, their partner is sure to tell them that's not ok.
Exemplar pieces are writing examples of what you are expecting from your writers for each type of writing. Once you've been doing writing workshop for awhile, you may just collect these. If you really want to be able to support your students, I would suggest writing some before you teach each unit. Ultimately, an exemplar piece of writing is a sample piece of writing that you expect your students to do. So you will probably want a couple piece for each unit, a low, middle and high so you have pieces to use with any student. These pieces can be used in mini-lessons, conferences, shared writing, small groups, etc. 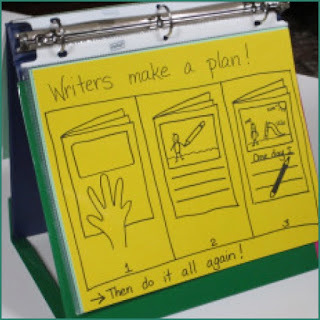 You can even keep them in page protectors and use a dry erase or vis-a-vis marker and just write on the page protector when you want to teach how to do something. When I want a student to add dialogue in their writing, I first show them how to add dialogue in one of my exmplar pieces a little above their level. Then I have them add dialogue in my same exemplar piece and then I have them go off and add it in theirs. If I had my exemplar piece in a page protector, I just wipe it all off and go on to the next group or conference. These make it so easy to support all of your students without having to come up with something on the fly. When they help you add to your piece, then add it to their own, it's great practice! I added this one in the first one and I had to add it here. Having fun in writer's workshop is so important. Just like when we want our kids to like reading, we have to show them our love for reading. It's the same thing with writing. While I know it might not be your favorite, you need to act like it is! Writing can be so hard and to ease some of the pain, we need to make it fun! Embrace those celebrations and make them feel like the authors they are. There you have it! 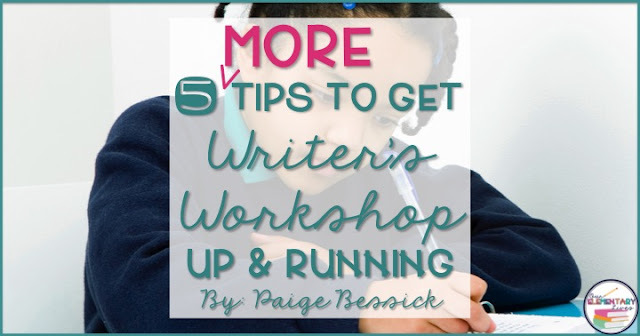 5 more great tips to get Writer's Workshop Up & Running. I hope these can help you, especially at the beginning of the year. I know when I was just starting, I would take any tips I could get to figure out how writer's workshop worked. Please share and pin so others can see these great tips too! 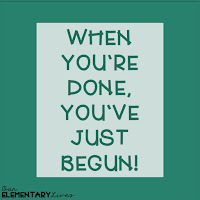 Do you have the posters on the "When you're done" chart available in your shop as a download? 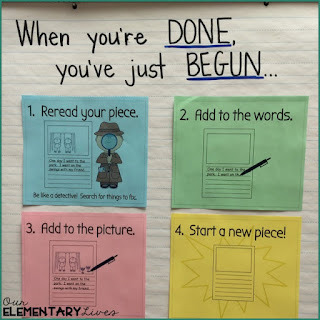 I like how you added "Reread" as the first step! Thanks for all the ideas!